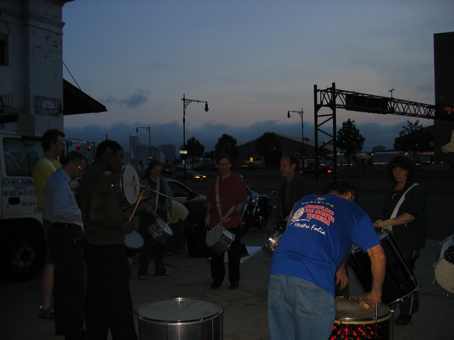 Last night I went drumming on the West Side Highway, across the street from the Hudson River. A practice I started although no one is this photo except the head of the band (Manhattan Samba) is aware of that. I wrote about this two books ago. Actually, there’s a nice synchronicity to me drumming last night. I learned to drum in response to turning 40. It was too loud to practice in my apartment so I would practice down by the river and annoy everyone there. (Most of them were very nice about it, especially the construction workers, which I wrote about. It was a sweet story.) One day I brought Ivo there to help me with patterns I was having trouble with. Now he holds classses there in the warmer months. It’s so nice to drum outside.